I spent a portion of the Martin Luther King, Jr. holiday randomly thumbing through books and magazines at Barnes and Noble. In the book section, I photographed the covers of several books to add to my ever-increasing ‘to read’ list. I moved to the magazine section and my eyes were drawn to Ebony magazine’s February issue with a picture of the beautiful couple Carmelo and La La Anthony on the cover. I grabbed the magazine and noticed that there were two other covers available with couples Nick Cannon and Maria Carey and David and Tamela Mann. The theme of the issue was ‘Celebrating Black Love’. Okay Ebony. I’m with you. Let’s celebrate Black Love. Tucked away in the back of the magazine between a Nelson Mandela tribute and photo from the Ebony archives were the stories of the three couples previously mentioned. 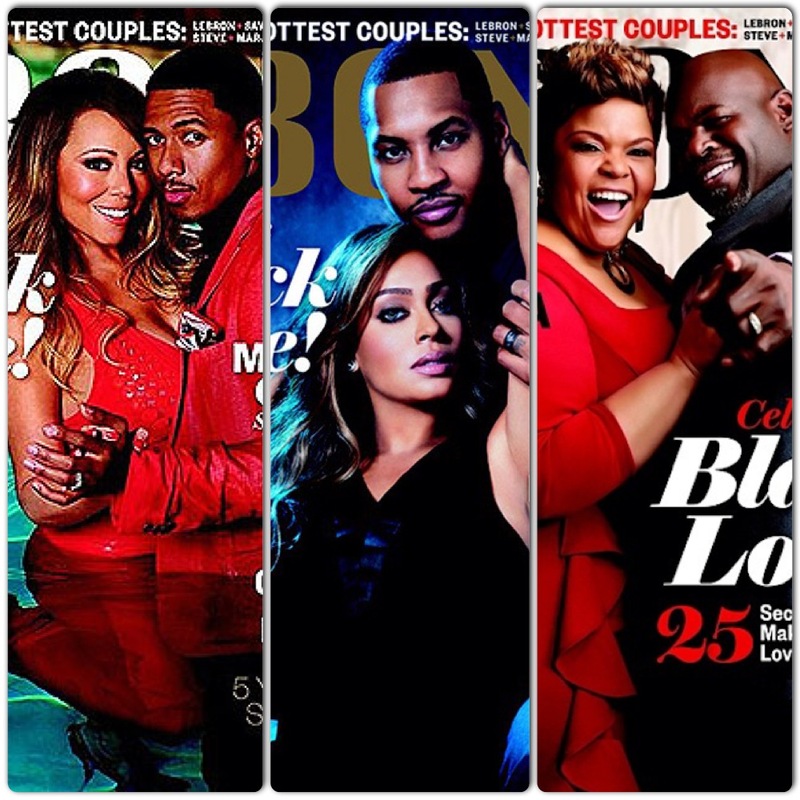 ‘Love, Actually’, ‘Through the Fire’, and ‘All-Star Romance’ were celebratory pieces that examined the business and marital success of the Cannon-Carey duo; highlighted the 25 years and going strong marriage of the Mann’s; and debunked the perception that all male professional athletes aim to be womanizers as readers were exposed to how Carmelo Anthony decided very young and very quickly that he wanted his friend La La Vasquez to be his wife. Yes, these articles did indeed celebrate Black Love. Following the last story is more celebration of Black Love as Ebony’s ’10 Sexiest Couples’ were included in a pictorial. These couples included Nicole Murphy and Michael Strahan, Amar’e and Alexis Stoudemire, Viola Davis and Julius Tennon, Lebron James and Savannah Brinson James, Kimberly Jackson and Ice Cube, Solange Knowles and Alan Ferguson, Steve and Marjorie Harvey, Ciara and Future, Jurnee Smollett-Bell and Josiah Bell, and Brandy and Ryan Press. Again, Ebony scored with these couples in different stages of their relationships. This pictorial was yet another celebration of Black Love. Since 1945, Ebony has promoted the experiences of Black people in an affirming manner. It has been a beacon for addressing political, educational, cultural, religious, financial, relationship, and identity issues in the Black community. In recent years, Ebony has expanded its audience by providing more emphasis on the issues for Black LGBTQ individuals. Just last year, there were at least eight articles or letters focused on the LGBTQ community – Pride, Workplace Inequality, a Welcome Home Letter, Black LGBT Pioneers, Kwanzaa, and Coming out to Family. And yes, there were two articles on Black LGBTQ Love – Rashad Burgess and Bishop Oliver Clyde Allen III (and their daughter) were included in the ‘Coolest Black Family in America’ and the wedding of Kappa Alpha Psi fraternity members Robert Brown and Nathanael Gay were celebrated. These are great examples of Black LGBTQ Love. Noting the previous examples, it is not my suggestion that Ebony is consistently exclusionary in its celebration of Black Love. However, it is my concern that Ebony is NOT consistently inclusionary in its celebration of Black Love – and that’s a serious issue. Black LGBTQ couples should not be celebrated only when perceived as unique. [The article on the Burgess-Allen couple noted the two were ‘revolutionary’ and ‘ardent innovators’, likely due to their commitment to one another and religious convictions; and many perceived the wedding of Brown and Gay to be unique in part due to their membership in a traditionally Black fraternity.] Black LGBTQ couples are not anomalies and the scattered inclusion of said couples suggests otherwise. In the 2015 ‘Celebrate Black Love’ issue, I hope Ebony will begin the practice of being consistently inclusionary. While there is limited ‘out’ representation of Black LGBTQ Love among Black celebrities, those couples do exist. Consider adding Monifah Carter and Terez Mychell or Janet Mock and Aaron Tredwell to the list. Lee Daniels, Meshell Ndegeocello, RuPaul, etc. are In addition, Lewis Duckett and Billy Jones, who married last year after being together for 46 years, might not be Hollywood celebrities but they are the epitome of long-lasting Black Love. It’s time to celebrate Black Love in its many forms. Ebony, you have the platform and the voice to remind readers that Black Love is Lesbian Love, Gay Love, Bisexual Love, Transgendered Love, and Queer Love. Black Love is Love, Actually – and Unconditionally.